It wasn’t long ago that apps were all the rage. Customers were downloading them at insane rates, companies and developers were pouring millions of dollars into them, and everyone was happy. But here we are in late 2016, and the entire app marketplace is about to come crashing down. If you aren’t actively monitoring the mobile app landscape, then you may not be privy to the fact that mobile apps are decaying. It’s been a rather silent death, with sudden surges in downloads of popular games (such as Pokemon Go) keeping the fire burning. 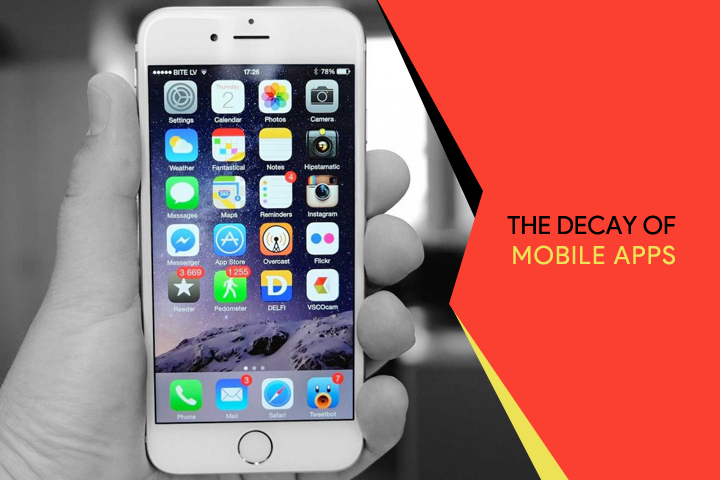 Let’s begin with the most alarming statistic of all: 49 percent of all smartphone users download zero apps per month. That means half of the marketplace is no longer actively participating in new downloads. So, if you’re launching a mobile app today, you must immediately cut your group of potential customers in half. Another 13 percent download just one app per month, while 11 percent download two. That means only 27 percent of the marketplace downloads three or more apps per month. If you’re in the app development business, these are sobering numbers. Proponents of mobile apps and push notifications like to point to the fact that mobile apps still account for the vast majority of the average smartphone user’s time. And while this is true, what they fail to realize is that the top 200 apps command 70 percent of total usage time. Since most businesses don’t have a top-200 app, they’re fighting hundreds of thousands of other apps for a portion of the remaining 30 percent. Businesses are coming to the realization that this is an uphill battle that’s not worth fighting. As businesses become increasingly aware of statistics such as these, they’re beginning to drop their mobile apps. Gartner reports that by 2019, 20 percent of all major brands will have abandoned their mobile apps. Instead, they’ll be turning their attention towards more progressive and responsive forms of communication. As consumers become more comfortable with chat bots, more businesses will begin adopting their own tools. This will lead to greater innovation and functionality, paving the way for automation like we’ve never seen before. One of the tremendously powerful features of chat bot technology is that chat bots can actually learn from their interactions with human users and become smarter. They’re able to record past exchanges and make logical assumptions for the future based on these outcomes. As a result, the opportunities in marketing, advertising, and customer service are endless. In addition to chat bots, expect to see SMS adoption rates skyrocket as more businesses turn to this high-returning messaging channel to communicate with customers. SMS features faster and higher open rates, better response times, and is seen as more personal than alternative forms of communication. But what makes SMS even more attractive is its flexibility. From finance and healthcare to retail and travel, virtually any company can use it. Possible use cases include service appointment reminders, two-factor authentication and password resets, product promotions, and more. But here’s the real kicker: SMS and chat bots can be integrated together. If you want to look at it in terms of an analogy, SMS is the car and chat bot technology is the engine. The right SMS platform, powered by the right chat bot, can provide exponentially more value than any mobile app ever could. That’s the goal of SMS and chat bots moving forward: Make communication between brands and their customers more natural and effortless. Customers love mobile technology, but are tired of having to invest so much time and effort into learning how to do something. The shift away from mobile apps will ease this pain point. As you can clearly see, the future of mobile messaging is found in SMS and chat bots – not mobile apps. While some businesses will still enjoy a return from their mobile apps, this will be the exception to the rule. If you want to maximize your resources, then you’re better off focusing on SMS. At OpenMarket, we offer APIs and SaaS-based mobile messaging solutions for building and deploying mobile programs that support both one-way and two-way messaging. If you’re interested in learning more about our solutions and how they can help your business modernize its communication, please contact us today! We’d be happy to discuss it in more detail.